Q: Can you specify what you mean by stabilized soil? A: Stabilized soil is usually soil that has been amended by the addition of something that will make it harden, or make it more stable in weather conditions. Traditional stabilizers have been Portland cement, lime, or emulsified asphalt. Q: Under what conditions would you recommend stabilizing the soil mix with lime or Portland cement? A: Soil stabilization is rarely needed in earthbag construction. Under some circumstances it might be advised in parts of lintels or arches to make them more rigid, or if the fill material is too loose, such as with very fine sand, that doesn't want to compact into a solid. Q: Could you tell me what the ratio of sand and cement is needed to stabilize the sand? A: You only need about 4 - 6% cement by volume to stabilize the sand. It needs to be mixed thoroughly and moistened to work. Run some tests with your sand to make sure what works. Q: If bag builders use earth with a little cement to harden it - do they mix it in with a spade into a large pile of earth or somehow mix it in for each bagful? A: I haven't done this, but I imagine mixing it in a large pile, or even with a cement mixer would work. Q: I have sand where I want to build a project. If one was to use Portland cement with sand, what ratio of mixture would you suggest? A: You could probably sufficiently stabilize sand with a ratio of about 15:1 sand to cement; although some experimentation is advised. Ordinary concrete can be made with about 9:1. Q: I live in HI and plan on building an earth bag wall for the perimeter fencing for our land. What's the correct mix of cement to cinder and do we mix the bag fill dry or wet? Q: I am planning on building a sand bag house in the dome shape. Can you tell me is it necessary to use a small percentage of cement in the earth mix. My local soil has a great texture which allows it to be compacted quite hard. I plan to clad with chicken mesh and then plaster over. A: There are differences of opinion about the need to stabilize soil before filling the bags, but in your situation I would say that to do so would be overkill. If your soil packs well and you plan to reinforce the plaster with chicken wire then you are certainly safe to proceed without cement. Q: We have a small winter home in Baja Mexico and want to construct a workshop/generator room using sand filled bags. I would appreciate any advice as to whether adding cement to the bags would be of value and if so what ratio sand/cement. A: Adding cement to the soil you put in the bags will definitely make it more solid, but may not be necessary. If the your local soil packs into a fairly solid mass when tamped, then it is likely OK to use as is, especially if you protect the bags with a good plaster. I guess I should have written that I will be working with straight sand with absolutely no soils of any sort. Some sand will pack pretty nicely, but other sand will not, especially the very fine, spherical sand that is a shape-shifter. If your walls are vertical, then even this can be used without cement, but for domes I would suggest stabilizing with cement, or added clay. Q: My friend used 10% cement in the mix for his earthbag dome. I am not thrilled about using cement myself. But the east side of the Big Island is way way humid, rains every month. My land is like 25 miles from his and it is slightly less humid. I'm thinking about 5% cement in the mix for my project. There are several people on the Internet that claim that you don't need cement at all. I could see that kind of reasoning on cost factors, cement is not free at all. But I also think that by skipping cement the earthbag building becomes temporary. If my earthbag building is going to start to crumble in 20 years because the humidity is taking a toll, I cannot claim superiority over wooden structures, which begin to rot if not properly treated against termites. My property is really close to the lava flow, and lava rock is everywhere. My friend wants me to use his silt/cement mix, which means buying the silt and having to unload it by truck. I'm thinking on somehow using that lava rock in the mix, but it might take too much physical energy to crush that lava with simple tools. And I'm not sure on how good the lava powder is against humidity. A: As for the need to use cement in your mix, I am of the opinion that it is generally unnecessary. It certainly makes for a solid wall that doesn't rely on the bag material to hold it together, but the same could be said about ordinary adobe soil. As far as I know Nader Khalili didn't use cement in his buildings. I used crushed volcanic rock in the house I built in Colorado, and it worked out fine, and I expect it to last for centuries. The polypropylene is not affected by moisture; it is only effected by sunlight, so as long as there is a good plaster protecting it, there should be no problems. Besides, once you have a solid plaster on both sides, the wall becomes nearly monolithic. I actually think that using cement can make the building more vulnerable to earthquakes, because the material cannot give or sway in any direction...it can only break apart, whereas looser material is more malleable. In some instances, very fine, slippery sand can be a problem in building domes because it doesn't pack well and deforms too easily. In this case a bit of cement might make it usable. I don't know what the qualities of your silt is, whether the cement might useful or not. I would think that you could somehow incorporate at least some of your lava rock...I built a whole house with it. Mine was very well insulated...much better than a cement building would be. Q: I've found a statement that "you would only want about 30% clay to 70% sandier soil" to avoid the dangers of shrink-swell that many clays exhibit. I've also run across the comment that "soil stabilization is rarely needed in earthbag construction". It seems to me, however, that the troubles of expansive clays could be eliminated by completely stabilizing the clay with hydrated lime. My site is rich nearly pure red and gray clay that is known to be "severely expansive", predominantly montmorillonite. It has no sand to speak of. Having done my own experiments, I found I can eliminate the clay's shrink-swell property with hydrated lime (8% w/w dry); with some water it turns it into a highly workable moist dirt that, when dry, shows more than 100 psi unconstrained compressive strength. I would like to know if anyone has used only clay, completely stabilized with lime, as a fill material. If so, where might I find guidance beyond my own experiments? If not, does my description of the properties make this clay seem viable as a sole-ingredient for use in earthbag construction? Would I be recommended, nevertheless, to include sand in the fill material and, if so, how much and why? A: I have not heard of people stabilizing pure clay with lime, although from your experiments this sounds like a promising approach. If doing this eliminates that expansion/contraction cycle of clay, then this material should make an excellent fill material for earthbag construction. I suggest that you do some further experimentation with a small project and see how it fares. In my experience pure lime plaster also will shrink quite a bit when it dries, which is one reason that it also needs some sand added to keep this from happening. It is a mystery to me how both clay and lime mixed together will not shrink! C: Isn't lime a wonderful substance? The chemistry of its many uses seem straightforward, but it is chemistry. Actually, the pozzolanic reactions of hydraulic cements are more complex. First off, the pH does need to be correct for "full" stabilization. The normal protocol calls for attaining pH 12.5 after a 30 minute period in a standard 5:1 water mix. One paper I read said that full stabilization may be achieved at pH as low as 10, depending on some soil characteristics, but that by following the guidance of pH 12.3 any expansive clay-bearing soil can be counted on to become fully stabilized. The soil at our "ranch" is basically 3 to 8 inches of silt over solid, sticky, plastic clay. Using a wide range of lime concentrations, I tested a 30% clay/70% silt mixture which yielded a 1.5% by weight, dry, of hydrated lime required to reach the pH 12.3. All well and good, except we'd have to use all the top soil, and only a little of the clay, scraped off of a large area to supply fill material. Our test holes have shown that our clay extends to feet in depth, a veritable bounty, and we would rather not use the seemingly meager topsoil in the bags - that belongs to the biosphere. My tests with liming a large amount of raw, heavy, sticky clay showed a rather magical transformation to a non-sticky dirt. I chopped up the clay into pieces 1 to 1-1/2 inches in size, wet it and distributed the hydrated lime over it. After roughly mixing it up, I let it sit - within minutes the physical characteristics were clearly changing. After 24 hours, and a couple more quick mixes, it was "done" - completely transformed. Here's where I made cylindrical samples - including one with 15% of silt topsoil added. After 4 days of drying in ambient conditions, the stabilized-clay-only easily bucked 100 psi (14,400 psf) while the sample with silt was crushed at half that pressure. Clearly, any silt is not desired. The clay-only actually failed on it's edge only as the varying weight shifted and rocked the sample during loading. As I understand the mechanism of lime stabilization of clay, an ionic exchange happens in the highly alkaline environment to replace aluminum and sodium with calcium supplied by the lime. Doing so, the clay flocculates and the ability of the clay plates to hold water in between them is decreased. Plasticity index and water content drop while plasticity limit and "optimum water content" increase. These results create a material that then doesn't shrink or swell with varying water content. Being less plastic, of course, means it doesn't ooze. Over time, the components can even engage in some pozzolanic (cementation) reactions too. It's all very cool, but my ignorance makes me anxious now that it seems I'm on the "bleeding edge" of research! Ha! Oh, before I forget: Texas Department of Transportation is big on using lime to stabilize our expansive clays for use as roadway subgrades. Also, our Dallas/Fort Worth International Airport was built upon stabilized clay. Without the use of lime to eliminate the "shrink-swell" of our clays, our roads and the airport runways would have cracked up into un-usability. It's kind of weird that foundation repair is big business here ... it's apparently not worthy to stabilize the soil before setting the concrete slab foundation! There is one caveat to lime-stabilization: unknown sulfates in the soil can destroy subgrades. Texas is keen on remembering this as a nearby highway was destroyed before learning the threat of sulfate-caused formation of ettringite made the roadway heave by feet after constructing it. If the sulfate concentration is stable, and not monstrously high, it can be countered with appropriate lime and/or pozzolanic silica additions. I've not been able to find any evidence of sulfates at our "ranch", thank goodness. And now for something completely different ... Class C fly ash! It's really a blast experimenting with a power-plant waste product that acts like portland cement. I got a 100-pound sample of it from a local company that specializes in oil-field supplies; it's apparently used to strengthen drill hole casings and what not. Straight up, it's useful for some applications. Better, though, is adding 9% to 11% hydrated lime and using 40% water-to-cementatious ratio. It's wonderfully workable (but quick setting). The stuff begins setting up seconds after adding water, so my next experiment is to see if I can lengthen the working time to something closer to portland cement. Perhaps you already know that the last ingredient added to portland cement, while the clinkers are ground up, is gypsum. Powdered drywall, I mean gypsum, stalls the earliest pozzolanic reactions ... I suspect I can achieve a similar effect with fly ash concrete as well. One thing I've been concerned about is the relative concentration of bad stuff in the fly ash, heavy metals in particular. I've read a peer-reviewed paper, though, that determined that the heavy metal leachants from cast fly ash were no more than from any other building material even though the content is there. I think it's better to use it instead of Portland cement, especially since casting it "sequesters" it in a fixed locality for a useful purpose. Q: What is the best bag filling to deal with high moisture content and heavy rains? A: The most secure fill material for earthbag buildings would be Portland cement stabilized soil, as this could actually survive some immersion in water for a period and still retain its shape. Q: I am not quite sure that the numbers for hydrated lime add up as Kaki suggested. I was close to buying a couple of hydrated lime bags to do some testing and pay for some PSI certification from a local lab. But on a cost basis, I don't see how hydrated lime is going to be cheaper than cement. On the Big Island, a 94 pound bag of cement costs close to $15. On the other hand, a 35 pound bag of hydrated lime costs close to $12 In the cindercrete mix we use around 8 parts of cinder, 1 part of blue rock, 1 part cement and 1 part water. If we are going to use 1 solid part of hydrated lime, it is just too expensive. Unless Kaki was talking about 1 part of very liquid hydrated lime paste. A: I doubt that Kaki was suggesting that you use the lime only. From my experience, pure lime will shrink a great deal as it cures (and it takes a very long time to cure). You need to add sand to the lime to make it stronger and keep it from shrinking too much...sort of like adding sand to clay to make adobe. I suggest that you try replacing the cement in your formula with the lime and see how well this performs. It doesn't need to set up to the specs of concrete, only become firm enough that it will stay in place without shifting over time. Then if you leave the bag material on before plastering, your wall will be extremely durable. Lime is considerably lighter than cement per volume, so that 35 pound bag will go almost as far as the 94 pound bag of cement. Q: We have land with at least 169 different soil types. But the area for building is a heavy mix of sand, with a small amount of clay. We planned on using some portland cement mixed in with our soil. So if we cover them with a tarp for a week or so after installing them that would give us a sufficient cure time? A: I suggest that you keep one test bag separate from your wall and use it a guide for how long it may need to be cured; there are so many variables in all this that it is hard to say in advance. Q: I thought the mixture was 10% concrete / 90% sand, (more or less and I know this is varied depending on location) moist but not dripping. If you use a machine to fill the bags you'll have lots of dry bags to stack. Does that make the finished structure weaker? A: There have been many different mixes of materials used successfully for filling bags, and the concrete/sand mix is just one option...one that is not particularly green because of all that cement. A better, and equally durable, mix would be something approaching standard adobe (20-30% clay and the rest sand). Even just 10% clay can make a decent mix; all that is needed is that material solidify sufficiently after having been dampened and tamped to form a block that will not shape-shift over time. Also, lime can be used to stabilize a loose soil, and this is more environmentally benign since it reabsorbs the CO2 released during its manufacture. The house I made in Colorado used scoria (a type of volcanic rock) that was crushed to fill the bags, and this worked our great because it is light-weight and insulating. Q: I am looking into building semi-subterranean sandbag spaces in a dry desert environment in Africa. The rainfall is less than 3 mm per year, but the area receives daily moisture through fog. The available soil is fairly granular river sand (from dry riverbeds), and we are thinking of either importing lime or cement as stabilizer, as clay is virtually non-existent within reasonable distances. We want to sink the units at least 1.5m deep, and cover the domes with at least 600 mm sand, to provide a thermally buffered interior space. Any suggestions or examples of previous experience will be extremely helpful. A: Stabilizing your sand with cement or lime will likely be essential to build domes; otherwise it might collapse because of the sand shifting inside the bags, especially with pressure from any berming. I am not aware of any earthbag domes having been completely buried like you propose, so this would clearly be experimental. If you want to proceed with this, I suggest that you stabilize your sand with quite a bit of cement (at least 10%) and start with a small test dome to become confident that it will work. Please let us know how this works out. Q: We are in the process of plastering a 15' dome and a 15' vertical cylindrical building, side by side. After constructing both, I found out that the dome requires only slightly extra effort but delivers more economy for space and strength. However, you are right, it is more difficult to waterproof, esp. in the tropics like Belize. Can you say if it is better to stabilize the material with cement? A: Nader Khalili tended to use cement to stabilize the soil in his dome projects, especially toward the end of his career. I am not convinced it is necessary, but it adds a degree of security if a dome did develop a significant leak and saturated the material in the bags. 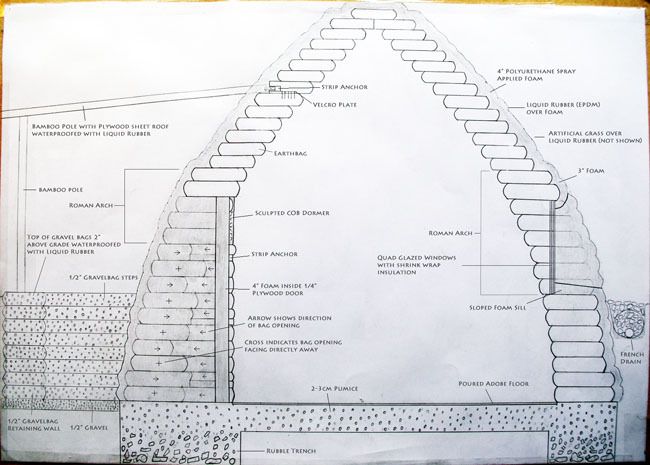 Nice sketch of a cross section of your dome project. It all looks very well thought out to me, and should create a very thermally efficient small building. Q: I've got a stumper for the experts. I am building a small Earthbag dome as a test project in the tropics. I've jar tested my local soil and found it to be 30% clay/silt and 70% small fines and sand. I'm using 10% Portland cement by volume. My first mixes of came out of the mixer as cement coated earthen balls. So I started fine screening (1/4") the soil to break it up and reject any large clay clods. This has worked well until last night. We received a large amount of rain. Now the soil is very wet and clumps/rolls back into cement coated balls. Is it possible to mix stabilized cement soils using wet soil? A: That is a bit of a stumper. I know that clay and cement don't always want to combine, and they tend to serve the same function in binding the larger sandy particles together. You might need to increase the sand portion of your soil to get good results. Q: We are currently planning on stabilizing the earth inside of the sacks with lime. We like lime as an option because it is more environmentally friendly and there is a local place that mines and prepares lime (hydraulic type s). What percentage of lime do you recommend that we add to the mix to improve the impermeability and increase the strength? A: I suggest that you run some tests with your particular soil to see what works best. Try several batches with different ratios. I have always heard that working with lime can be tricky, partly because it does behave differently with different soils. I've read that lime works well as a stabilizer with soil mixes that have some clay content, and that they shouldn't be too sandy. We've got a really wide variety of soils available to choose from. Approximately what percentage of clay is ideal to have in a soil that will be stabilized with lime? I have used lime with straight sand, and it actually has hardened just fine. C: Unfortunately the clay content in our soil is about 2%--so we will be supplementing our fill with about 10-15% Portland cement. R: Have you actually tried using the native soil to see how well it compacts after being dampened, tamped into a bag, and allowed to cure until dry? If not, you might be surprised at how solid it is. If this natural soil is still too loose, then you might try to find a source for additional clay, rather than Portland cement (which is not only quite expensive, but also terrible for the environment, with all of the CO2 emitted during it's manufacture.) If you can't make the natural materials work, then you should at least consider the addition of hydrated lime instead of the cement, as it is much more environmentally benign (and also cheaper). If you are certain that the only way forward is to use cement, then you should know that normally only about 5-6% cement is used for soil stabilization, not 10-15%. Q: We are being put through the pains in Tucson, AZ as to building our Owen Geiger Zero Two Energy Home. They are requiring us to have the earthbags tested; we have tried all and they won't move. They want cement to get it to pass the test. Do you have any recommendations for what amount of cement? The only cement usage I found said 10% cement 30% gravel with 30% sand and soil. Any help you can provide for a correct mixture is appreciated. A: A variation of poured earth that has been around since cement was first formulated is soil cement. This is a dry pack (moist) earth/cement mixture which works especially well with rather sandy soil, but will also work with other soil types. The heavier soils with more clay content will probably require more Portland cement. Soil cement has been used to form walls, make floors, pave roads, stabilize river banks, etc. Here is some information about formulas: Make it by mixing earth with Portland cement to the desired depth, add water and mix again. Tamp, and cover with plastic to let it cure properly. Use 6 to 16 percent cement by volume according to the density of the soil. The denser the soil (clay, for instance), the higher percentage of cement to use. Six percent translates to 1 part cement to 15 parts soil; 16 percent translates to 1 part cement to 6 parts soil. Hopefully you can get by with less than 10%. A: (Patti Stouter) Strongest soil has all the particle sizes- is called 'well graded'. Adding extra strong clay and/or sand to your soil could put it up there for less expense than cement. When I stabilized some rather silty soil for a single shed course here in NY, I was appalled that it took about 12% to make it somewhat strong (my goal was to make it water resistant not stronger). If you must stabilize, you should add some lime with cement if the soil has much clay, and tweak to get least stabilizer, strongest mix. You should do your own tests for flexure by stacking weights on a block that's spanning 18" or so, to test mixes before you give it to the lab again. Q: How stable are the sand bags with all of our freezing and thawing during the winter time? A: It is best to keep the fill material in the bags as dry as possible after the structure is built, so without moisture there is no likely problem with freeze/thaw cycles. 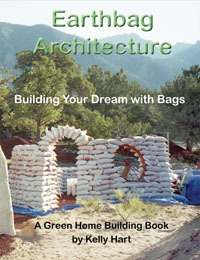 Earthbag buildings have been successfully built in all climates all over the world. When I built my first earthbag house in the very harsh climate in the mountains of Colorado, I filled the bags with crushed scoria, a lightweight volcanic stone that is insulating. If this is available in your area you might consider using it because your house will be more comfortable and less costly to to keep so. Q: I am about to experiment with different mixes of desert-loose-sand/cement to fill pp bags. The goal is to build a 4x6x3 meters dome. Do you recommend a specific percentage of cement with such type of sand? A: I suggest that you try a couple of samples with your local sandy soil, one with about 6% and another with about 10% and see how firm they get. My guess is that the lower percent is fine, but if you can still cause the soil in the bag to shift after it sets up, then go to a higher percent. Q: Would crushed volcanic stone, perlite, or rice hulls need to be combined with anything to bind them together? A: It is possible to use the loose material, as long as the wall is sufficiently buttressed, has solid bond beams that are connected via rebar into the wall, and all openings are also firmly supported. Q: Our original plan is to build the standard Eco-Dome "Moon Cacoon" from Cal-Earth. If we reinforce with cement, do you think this would be stable enough for a tropical climate? Or would you recommend a vertical walled structure instead? A: With cement-stabilized soil as fill, you at least don't have to worry about the dome collapsing if it gets wet. You still need to make sure that the plaster remains intact and waterproof to assure that there will be no moisture entering the building. With vertical walled structures, you can get by without any cement for stabilization of the fill and lime-stabilized exterior plaster is good, as long as there is a decent eave that protects the wall. Of course then you need the materials for a roof, so there are trade-offs either way.